It is cool, but... is it useful? Well, I wouldn't claim that it's so useful that it'll change your life, but yeah, I do find it useful. For one thing, I just like seeing where my attention is going. But it's also a good way to find out which feeds I can get rid of because I'm not really paying any attention to them. I think this is a great feature. I'm constantly trying to evaluate which feeds I should prune, and something like an Attention Report would save me time in the process. From what I read of Nick's thread, he is tracking forwarded posts. I would also like a count of posts I read or click on the post link (or link within a post?). Hope this helps and keep working on FeedDemon! The concept of having a tool that can synch at home/work/mobile is pretty awesome. And just for the record, I'm an over 50 engineer (ok, I need reading glasses for the Mobile reader...). 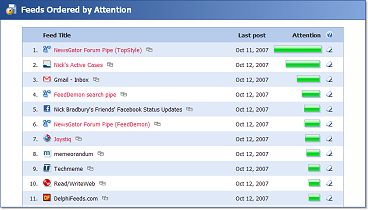 You're using Yahoo Pipes for the forums instead of the built-in RSS? What kind of improvements do you get that way? @Paul, the "Statistics" page in Feed Properties shows you a lot of data, including the number of posts you've visited in that feed. 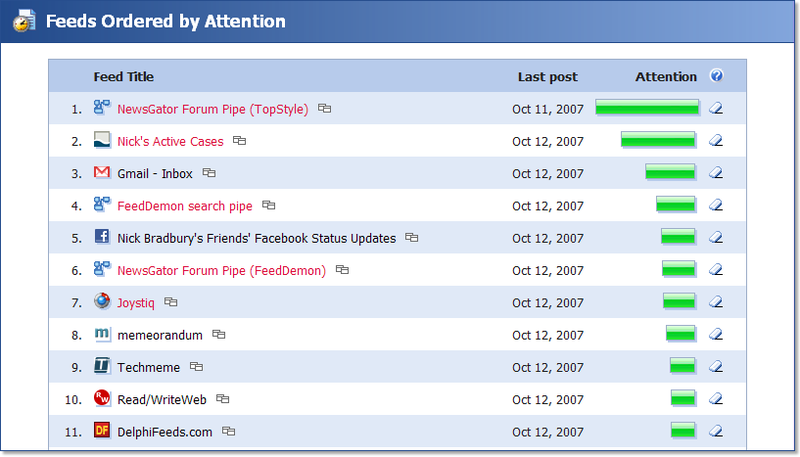 The upcoming FeedDemon 2.6 will also track links clicked within posts. I'd be interested in more detail on how you compute the scores. Nothing that gives away your competitive edge of course but just some generalisations of what you are tracking that amounts to attention. @Paul: I'm planning to write a blog post about how FD calculates attention - I expect to post it next week.